We have always had to work with a budget for groceries. During Clay’s active duty days that pay didn’t stretch that far if we were not very careful. So I got in the habit of making a clear budget and learning how to maximize my savings on groceries as best as I could. One of the main ways that I did that was through the use of coupons. What about you? 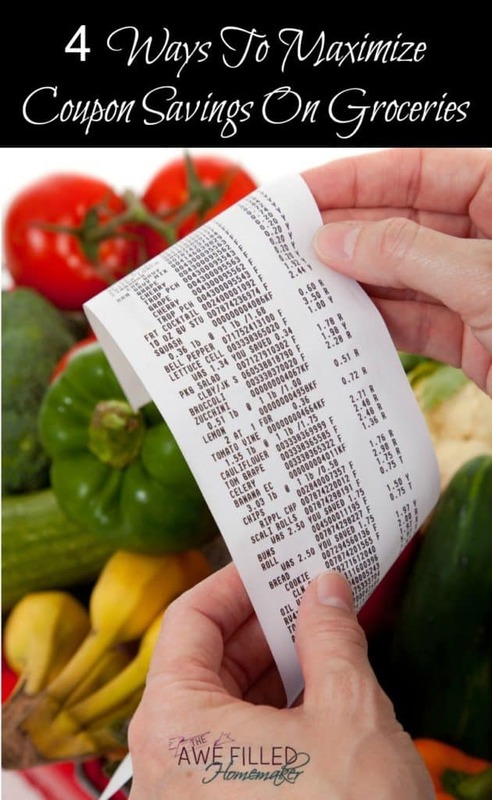 Do you use coupons at the grocery store only to find that you still aren’t saving that much money? You’re not alone! There are a lot of couponing tips and tricks that many people are unaware of. Using your coupons wisely can lead to major savings. You may even be able to get some free items! Are you wondering how to make that happen? Combine coupons and sales. You’ll see the most savings when you use coupons in combination with items that are already on sale. In order to do this, you will need to forget about brand loyalty and break away from your comfort zone. While you might love one particular flavor of yogurt, you might be able to save more money on another similar brand yogurt if you have a coupon and the store is already having a sale. Use more than one coupon per item. An extreme couponing secret that can help you save loads of money on groceries is using not just one but two coupons on each item. In addition to using a coupon for the store you’re shopping at, you’ll also want to use a coupon from the manufacturer. This means that you’ll want to clip coupons from your weekly circulars and check online for manufacturer coupons as well. ***Side Note. A bonus tip here is to also find out if your store doubles coupons. There are several in my area that will double coupons up to .50 cents making your maximum savings for one coupon $1.00! Spend whatever it takes to get money off. Is your store offering a coupon that allows you to take $3 off a $15 purchase? If you’re using other coupons on your purchase, you might discard this coupon, but you shouldn’t. Use these types of coupons in combination with other in-store coupons and manufacturer coupons on items that are already on sale to save the most money on your groceries. Buy items in bulk. Another one of the tricks that extreme couponers use to save the most money possible at the grocery store is buying items in bulk. Rather than buying toilet paper when they’re close to running out, they stockpile toilet paper whenever they’re able to get the best possible deal on it. Keep in mind that this tends to work best with non-perishable items, but even things like yogurt and fresh produce can be frozen for later use. These are just 4 simple ways to maximize coupon savings on groceries! It’s also important to make sure that you read your grocery store’s coupon policies ahead of time to make sure you’ll be allowed to use multiple coupons and combine coupons with sales. Do you use coupons for when grocery shopping?